If you've decided it is due time to finally time to do away with the onboard audio on your mobile computer, wanting something that makes your music collection worth listening to, then you can turn to ASUS for that as well. 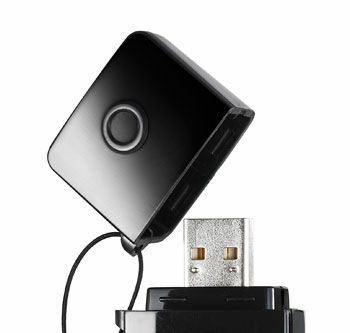 The Xonar U3 is a compact USB sound card, not much bigger than a flash drive. The goal is to provide a product for the person who is constantly on the go, loves to listen to their music, but isn't going to settle for the integrated solution any longer. So exactly how good can such a tiny device actually be, can it really deliver anything close to what a larger sibling Xonar can? We plan to answer that, so sit back and dive in! ASUS has been a name many of us have become familiar with when it comes to high quality and performance, be it their motherboards or graphics cards. They have even made OEM motherboards for HP systems, usually which are slightly stripped versions of a retail model and equipped with a crippled BIOS devoid of overclocking options, but still every bit as reliable. They have expanded their reach over the years to include every component it takes to build a complete computer, and even selling turn-key desktops, laptops and tablets of their own. You name it, ASUS dominates it. Creative may be a far more familiar name to many of you when it comes to computer sound cards, having been around since the early 90s, with the X-Fi line being what many have turned to over the years. MSI, Gigabyte, ASRock, and even ASUS have all incorporated X-Fi into their motherboards in some fashion or other, though typically it is the X-Fi Motherboard software suite, which still uses the standard HD-Audio Codec to do the output of audio. Then a few years back ASUS got an audio itch. Seems the decided that using the same old codec everyone else uses or that building a sound card with rather generic components just wasn't good enough anymore, and so the Xonar line was born. They have offered a wide gamut of audio solutions over the last few years, from the Xonar DS for the more budget conscious looking for an upgrade, all the way up to the new Xonar Essence One for the true blooded audiophile. Turn your NB into a personal Hi-Fi center with Xonar U3 -- Get a BIG UPGRADE from USB audio with Xonar U3’s crisp and clear sound for music, movie, gaming and VOIP enjoyment! We are taking our first look at a product from the ever popular line of sound cards from the ASUS Xonar line. More and more are we using laptops for our everyday work which gives us the freedom sit anywhere you want, whether that be a desk, your favorite recliner, comfy sofa seat, or even your bed. Music is also part of many of our every day lives, either to relax to or be inspired by while working, but that leaves a few possible issues for some. Not everyone may have a nice high end audio system to listen to, or perhaps if you do, not everyone else in the house may necessarily find the same music relaxing. That means we are relegated to using ear and headphones, thus left with the onboard solution our portable computers come with, which for many of us just won't cut the mustard. 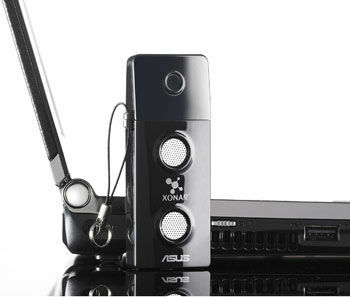 Now, ASUS does makes a number of fine sounding computer sound cards, but sadly these are not (easily) compatible with our laptops or netbooks; enter, the Xonar U3 USB. The Xonar U3 offers a USB solution to this problem, where by making it compatible with nearly everything that has a USB port, provided it runs Windows that is. It comes in only slightly bigger then most of the USB Flash Drives at 2.8"(L) x 1.2"(W) x 0.6"(T), but that puts it at just wide or thick enough to obstruct any other USB ports next to it. Ah, but fear not, ASUS has you covered! 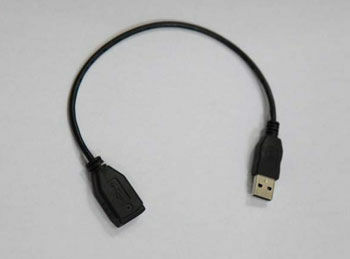 Included with the U3 is a 12" long USB extension cable which allows you to utilize all your USB connections again. Also included is an S/PDIF TOSLINK adapter. 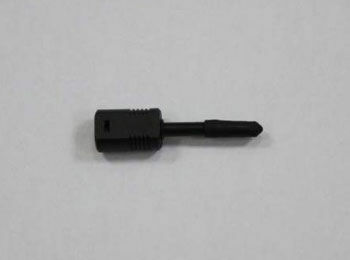 You may notice in the above shot that there doesn't seem to be an optical port, but it is combined conveniently into the 3.5mm headphones jack. Of course, there is also a driver CD to get you started so you don't have to use the awful sounding Microsoft universal HDA drivers, though I suggest grabbing the latest drivers from the Xonar U3 download page. Curious what is hidden beneath the U3's plastic casing? Me too! Thankfully they didn't sonically plastic-weld the top and bottom together, so squeezing the sides and running my thumbnail along the seam was enough to pop the latches. I was actually expecting to see some tiny electrolytic capacitors, but all that is feature are the tiny solid SMD variants. Hopes and dreams of simple modding fun are swept away, is alright because this is what allows the device to be built by machines, thus how we arrive at the $40 price tag. Whether or not that is a justified price will have to wait till the listening tests. Click to enlarge the close-up shots. The left picture is of the top and does may not seem to feature much, yet looks can be deceiving. Top side features the crystal oscillator in the bottom right corner, to it's left is the CMOS EEPROM for the firmware, and the square chip upper-middle is a Texas Instruments DRV601 (alt. close-up). This DRV601 is called a Stereo Line Driver, or rather it's an "Amplifier on a Chip", which is "capable of driving 2 Vrms into a 600Ω load at 3.3 V" (which explains a lot as you'll see in the listening impressions). The right picture is the back side and features a few capacitors, muting transistors and the main chip that is the brains of the U3. While it carries the ASUS brand and a UA100 part number, no doubt the 'UA' standing for USB Audio, is based off of (or rebadged) CMedia CM108AH USB audio processor. The included Xonar Audio Center software that all products come with. Each differ only in theme color and the features pertaining to the individual product. Initial loading of the program opens as pictured below. Primary options are found on the right and offer volume, SVN (Smart Volume), Mute and 5 DSP modes. Starting with the musical note and moving clockwise we have: Music mode, which enables Dolby Headphone [DH2 setting] , Amphitheater environmental effect and Dance EQ preset (these combined increase volume so be careful); Movie mode, enabled Dolby Headphone [DH2] and nothing else; GX Mode, which is used for playing games that support EAX effects and this wraps the calls to OpenAL, much the same way Creative's ALchemy does; HiFi mode, which is supposed to toggle the Hyper Grounding to improve audio but if you opt for this mode then keep in mind that it will not stack with anything else except SVN, not even EQ settings; and finally Game mode, which much the same as the others, only enables Dolby Headphone [DH2]. To expanded the Audio Center for more options, simply click the light gray ▲ button just under the vertical volume bar. Now we can get the party started!! With the "display" slid open we are greeted with an array of options. The Audio Channel drop down offers 2, 4, 6 and 8 channel options. Sample Rate for the U3 only offers the PCM 48kHz shown. Analog Out offers changing between Headphone or 2 Speaker, on account of only one analog jack. When Headphone is selected there is the little Hammer icon to it's right and that provides the selecting of three gain settings, which these are labeled VOIP Mode, Pro-Gaming Mode and Exciter Mode; intended for headphones Ω, 32~64Ω, and >64Ω, respectfully. Mixer tab. Above: Playback levels for L/R channel, Below: Mic level and Line-In level. Effects tab. Environment reverb effects and Environment Size. 10-band Equalizer with preset buttons and savable User presets. Vocal FX tab. This tab gives you the options to configure mic output routing and vocal effects; environmental or voice changing/shifting. If you click the ( i ) button on the Window control bar (next to minimize), you are given details for versions of drivers and features supported. DSP Info button offers further features, versions and licensing info. RightMark Audio Analyzer, or RMAA for short, is a quick and reliable test suite for computer audio testing developed by the folks at ixbt.com. It is easy to use and runs a whole whack of different tests, in all manner of different configurations, in order to find out the audio quality your equipment is capable of. It's ability to output the results as an eas(ier) to understanding HTML file is helpful for those who aren't as much of an audio enthusiast as the next person. So in an effort to relay that ease to you all I've simply taken each individual result's table from each exported HTML document, because the comparison results do not offer the same "plain-English" ranking, which is what will be of most use to many readers. To give an idea of sound quality, we are using the Xonar Xense as the baseline for quality, which it is the product you'd get if the Xonar Essence STX and the Xonar D2X had an illegitimate love child. Or in a bit plainer terms: a very good benchmark to pit others against. Also, all tests were conducted with the Xense as the reference Input. The reasoning behind this is to rule out if any distortion is a result of the device being tested by providing the cleanest possible line recording. Running a Loop-Back through just the U3 would leave us not knowing if, say, a high amount of IMD was because of it's Output or Input. Using the Xense for all of the recording helps remove a variable in the testing and allows us to see what only the tested device's output is able to deliver. What is probably the most visually prevalent is the 889's teal line, but that isn't necessarily a good thing mind you. My initial assumption was that it had something to do with the typical noisy nature of the Switch-Mode Power Supply topology in computer power supplies, despite being tested in the same system as the Xonar products. If that is the case then it is a testament to ASUS's DC filtering design. All of that aside, the results don't as easily tell us that which the ear does. Worthy of mention is something that seems inherited across all the motherboards and their onboard sound chips I've encountered, that being the high pitched whine which is picked up when moving the mouse around. I've noticed it on the old Realtek pre-HDA ALC650 codec, through to the ALC892 and the ALC889 used in testing. It is absent in the U3, even when using earphones. If a person were to judge how the U3's audio quality were to be just based on the internal circuitry appearance, especially when compared to that of the Xense, they may not be expecting much. To be honest, I was a bit worried when I first saw it because it didn't look like much more then one of those $3 USB audio products on eBay of similar appearance. Thankfully the size is no doubt where the similarities end and the U3 is quite up to the task, be it feeding current hungry 19Ω Shure SE210 IEMs, or "Cans" like the more voltage hungry 150Ω Sennheiser PC350 that are bundled with the Xense. Listening tests were conducted using the two aforementioned products: Shure SE210 Inner Ear Monitor, Sennheiser PC350 Headphones. Music genres used may not exactly be the broadest selection, but the intent was to go after music that I was familiar with, particularly when it came to how it sounded on an onboard device. Being a long time fan of Nine Inch Nails (NIN) means it is the primary choice, but other artists include The Prodigy, Crystal Castles and Daft Punk. The music player used for these tests was Foobar2000 v1.11.11 Beta2, no components active and a flat EQ. Similarly, the Xonar Audio Center was left to default settings. - "The Hand That Feeds" and "The Line Begins to Blur" off of their With Teeth album; 192kbps 44.1kHz Joint Stereo. In these two tracks the U3 has no problems coping with the gritty industrial inspired sounds, the quick hits of the percussion instruments and Trent Reznor's voice. When listened to on the onboard 889 solution it is immediately noticeable that the codec is forced to sacrifice highs and mids in an effort to produce enough "oomph" to drive even the IEMs. This fact especially noticed in "The Line Begins to Blur" where the beginning is a combination of an intentionally very distorted electronic bass hit that we find the 889 dropping vocals during every thud, not something that occurs during playback through the U3. - "Something I Can Never Have" and "And All That Could Have Been" off of the Limited Edition Still album; FLAC 507kbps 44.1kHz Stereo. This album is a bit of a mixed bag, being primarily consisting of 'unplugged' versions of tracks from The Fragile, recorded at Reznor's home-studio back when he lived in New Orleans. Yet it is also inclusive of a few new tracks which are only found on Still, but are instead full studio tracks and not the same 'unplugged' style. "Something I Can Never Have" is one of the original The Fragile tracks and is wonderfully done, featuring Reznor signing and playing the piano for most of the track, which both the U3 and 889 reproduces his solo piano work very well. The U3 offers a bit more detail in the keystrokes, and when the guitar kicks in at just after the 4minute mark is where the U3 offers a far more crisp listening experience. It further leaves the onboard solution in the dust at the 5:22 mark when Reznor kicks the vocals up a notch and the 889 starts to clip during his high notes. Later on in the album we reach "And All That Could Have Been", which is one of my favorite of these much more ear-friendly of NIN's The Fragile inspired tracks. It picks up where the previous unplugged track left off, where the recording has picked up in the background that it is now raining outside. This leads immediately into a solo guitar with Reznor signing, followed by bass guitar and piano. The plucking of guitar strings and their individual reverb are well defined by the U3, which if I were a musician I could no doubt pick out which string and note were being played. Crystal Castles' self-titled album is a form of Electronica and is heavily influenced by the 8-bit sound of days gone by. The track "Air War" was picked due to the wide range frequencies used, which I feel helps indicate any weak points in the sound card. You really do feel like you're listening to a different track encoding when comparing the U3 and 889 with the PC350 headphones, as the 889 just isn't able to drive them with what is needed in order to reproduce everything that is going on. This is evident through the whole song, but more so at the start of the track we have deep and thumping bass, quickly alternating with sharp highs; the U3 doesn't seem to bat an eye. Time for some comparatively old school, and funky sh...tuff ;) This track may also feature electronic style beats, it's inclusion isn't so much to highlight differences between the U3 and 889, but see how far we could push the U3. Seems this would be reaching it in terms of being able to keep up with long and heavy hitting bass, at least with PC350 headphones. Having the SE210s plugged in for this track seemed to be quite a suited match, though that isn't to say it still couldn't do with a bump to the lower sliders on the EQ. Though, it struggled with them on the PC350, coming on strong when bass first hit but sharply falling off. It kept up on the mids and high, bordering on being overly bright in some parts. The Dolby Headphone and associated Virtual effects offered do not seem to quite be my cup of tea. While the virtual options aren't too bad for music when listening through speakers (old Logitech Z-560, which still sound great), though it's not exactly the intended purpose. Trying all manner of combinations of Dolby Headphone and 7.1 Shifter while watching the A-Team (2010) movie simply did not result in anything that I would consider to be an enjoyable movie experience. Granted, the positional aspect made it seem more as though I was in a theater, the reverb/echo and total muddy sound just ruined it. So many fine details were lost while listening that switching back and forth with the HiFi button would highlight all that was being sacrificed. The Pro Logic is the worst offender of them all though, as it quiets down whatever you're listening to and shifts a good portion of the audio over to the left channel. As a result I can see no point in ever turning it on. This means if Analog is set to 2 Speaker you can never use Dolby Virtual Surround or 7.1 Shifter, as the latter requires the former to be enabled, and the former automatically enables Pro Logic. It really is quite impressive what the small stature of the ASUS Xonar U3 is able to pull off. The size was quite misleading, but after you plug it in and slip on your favorite headphones you'll see what all the fuss is about. It offers quite a lineup of features, even catering to a casual gamer if you want to take it that far. ASUS didn't just slap a chip on a USB PCB and call it good either, they included a pretty impressive little amplifier as well, one that proved quite capable. On the Crystal Castles "Air War" track it really impressed me that with lacking any sizable power cap, that it was able to swing between frequencies as effortlessly as it could. Bass was not too much trouble, providing ample thump to even sizable cans at default EQ settings. Clarity was also impressive, considering the whole package is not much larger than the area your onboard audio codec takes up. Sure, the Dolby virtual offerings may not be up to everyone's tastes, and that's understandable. I don't see myself ever using them, but they are there if I ever did find a situation where it worked nicely. 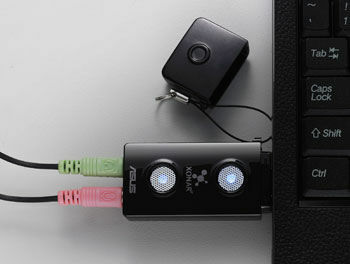 Alternatively, it can function as a simple USB S/PDIF Digital Audio device, which it includes TOSLink adapter as well. 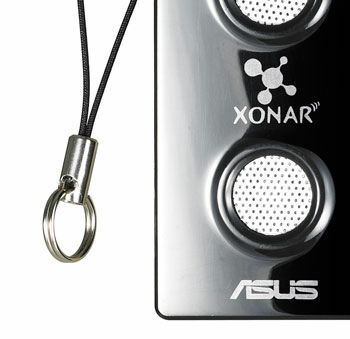 Currently the Xonar U3 can be found for around $40 online and with free shipping at most places. It's intention isn't to bring audiophile quality to your laptop, ASUS has the Xonar Essence One for that, but you seriously won't be disappointed by what you will get!